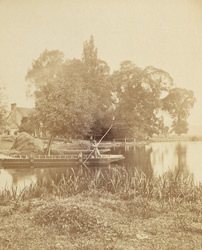 Medmenham Abbey "stands a few yards from the river's brink, in a pleasant and secluded spot, midway between Marlow and Henley. Of the ancient Abbey which formerly stood here we read that in the reign of Henry VIII. it was annexed to that of Bisham, at Marlow." At the Dissolution of the Monasteries it passed into the hands of the Duffield Family who in the late 18th century leased it to Sir Francis Dashwood, founder of the infamous Hell Fire Club. "Adjoining the Abbey is the Ferry Boat Inn, where a ready and hearty welcome always awaits the visitor. It is much frequented by artists, by one of whom its signboard was painted."